A friend sent me this video of car noises dubbed over little toys playing in a sandbox and I thought it was pretty cute. Then I learned, no, they’re not toys at all. This is just a very strange and interesting way to photograph cars, utilized in one of the most extreme driving environments ever. You may have read my ramblings about The King Of The Hammers being one of the greatest off-road events of the year, and it is. 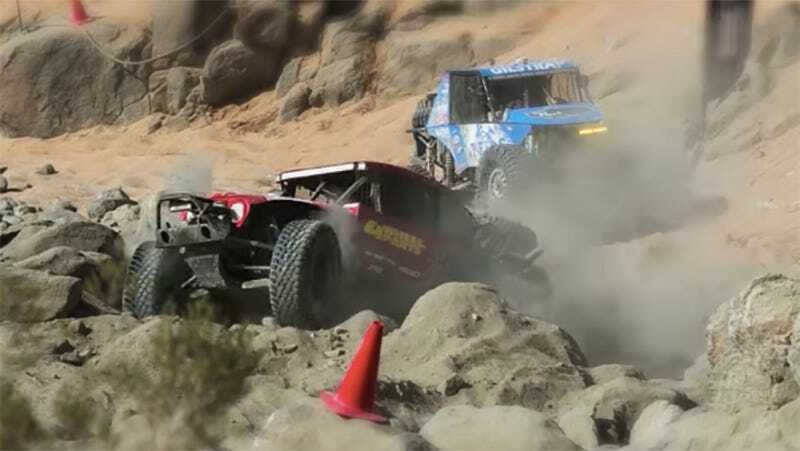 Tube-chassis trucks with huge tires and even bigger engines scramble over craggy rock obstacles and blast over open desert—how could that not be spectacular? And while you’re spectating, you’ve got all of Johnson Valley to buzz around in. Anyway, this year the media house Garbage Dream tried a different approach at covering it. By using tilt shift photography, the whole scene looks like it’s miniature even though it is indeed real images of the real race. In case you’ve never heard of tilt shift photography, basically what’s happening is the camera’s focus is adjusted so that two subjects that are different distances from the camera can be in focus at the same time. By adding blur to the edges of the image, you get the illusion of a super close-up macro shot with a really shallow depth of field. You can use a fancy lens to do this, or you might recognize it as one of the last tools in Instagram’s editing menu. Of course, adding the effect “post-camera” is never going to look as cool. Enjoy the tiniest, cutest King Of The Hammers ever. It’s so freaking wacky.